A University of Toledo research professor received a patent for a new device designed to assist with fine-tuning spinal surgeries. 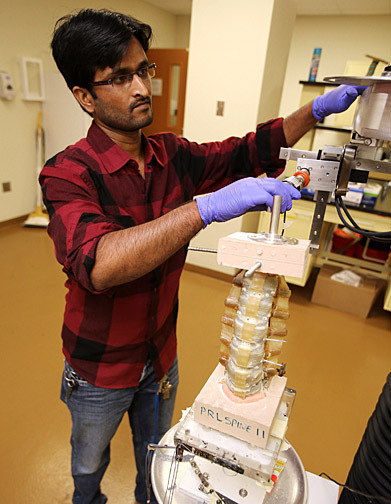 Manoj Kodigudla, research engineer in Dr. Vijay Goel’s lab, made adjustments to the spine testing device in the lab. Dr. Vijay Goel, professor of bioengineering and co-director of the Engineering Center for Orthopedic Research Excellence, said the Simplified Spine Testing Device standardizes the range-of-motion testing for pre- and post-surgical procedures. Additionally, Goel and his colleagues Dr. Anand Agarwal and Dr. Sarit Bhaduri, UT professors of bioengineering, founded a spinal biological startup company called OsteoNovus. Goel and Agarwal also founded Spinal Balance, and co-developed other medical devices, including the Libra Pedicle Screw System. The pre-sterilized, individually packaged screw system was designed to reduce the risk of surgical infection for spine surgery patients. This entry was posted on Monday, September 19th, 2016 at 3:28 am and is filed under Engineering, News, Research, UToday .